TasteBudA and I arrived for tonight’s Penguins game against the New York Islanders ahead of schedule so we could grab a bite to eat before puck drop. 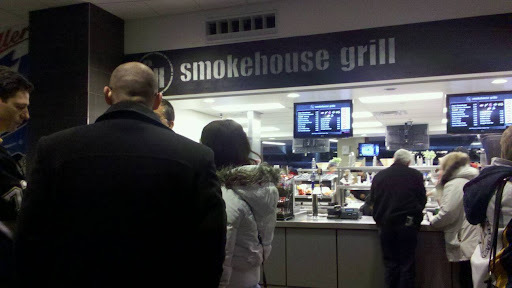 On the upper level of Consol Energy Center is smokehouse grill, a series of vendor windows around the Miller Lite Brew House. Among the standard menu options is a Sirloin French Dip. We both were drawn to it as something different and perhaps filling. The sandwich is a pile of thinly sliced sirloin on a small hoagie bun with provolone cheese. Like any dip, this was served with some au jus on the side. Be careful carrying it around the arena though, it’s liable to splash around. I would have found myself challenged to eat this in my seat, so we ate along the edge overlooking the city. The sandwich was very meaty and, despite it’s small appearance, very filling. Kudos to Consol for offering us something a little different tonight!